It’s that time of year again and the fools are popping up all over the web, with a good list over at Wikipedia. You can take your time looking through them, there’s bound to be something that took your fancy. Google again seems to take some of the most effort with 2 very nice ones. 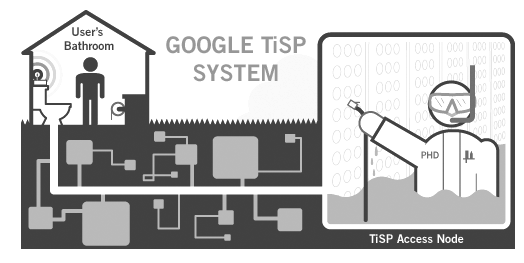 First, proving that the internet is indeed a series of tubes, or at least pipes, announce their new TiSP service, broadband connection through the sewer system (it’s only half a joke, much of the dark fibre owned by Google apparently does run along these types of pipes). All you have to do to get it to work is throw the one end of the cable down the loo and flush, whilst remembering not to let go. Secondly there mail system is now offering a print service Google Paper – notify which emails you want and they will print them and send them out to you. Ad-supported the cost is nothing to you and it will help you keep all of your favourite mails, just like they used to do with letters. The cost of postage is offset with the help of relevant, targeted, unobtrusive advertisements, which will appear on the back of your Gmail Paper prints in red, bold, 36 pt Helvetica. No pop-ups, no flashy animations—these are physically impossible in the paper medium.